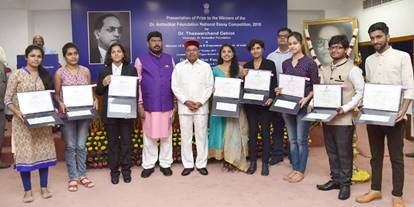 New Delhi: Shri Thaawarchand Gehlot, Minister of Social Justice and Empowerment and Chairman, Dr. Ambedkar Foundation presentedprizes to the winners of Dr. Ambedkar Foundation National Essay Competition -2016 at a function here yesterday. Shri Ram Das Athawale, Minister of State for Social Justice and Empowerment was also present. Addressing on the occasion, Shri Thaawarchand Gehlotcongratulated the winners of Dr. Ambedkar Foundation National Essay Competition Scheme-2016and wishes them all the best for their future career. The aim of this annual Essay Competition is to encourage writing on social issues, among the Students of Schools / Colleges / Universities / Institutes and arouse their interest in Dr. Ambedkar’s thoughts on fundamental social issues. Dr. Ambedkar Foundation National Essay Competition ismeant for Students of recognized schools (secondary & senior secondary schools i.e. from class 9th to class 12th) and colleges / Universities / Institutes. Prizes to the over-all best three entries in Hindi & English for school students range from Rs.10,000/- to Rs. 25,000/- and for Colleges /Universities /Institutes students it is from Rs. 25,000/ – to Rs. 1,00,000/-. 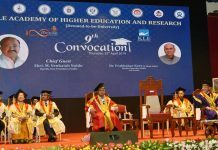 As per the provisions under the scheme, Dr. Ambedkar Foundation National Essay Competition-2016, was held in collaboration with the Babasaheb Bhimrao Ambedkar University (BBAU), Lucknow (UP).